Wirelogs are an important tool that can be used in debugging message flow. Wirelogs allow you to view the actual HTTP message that comes in and goes out from the ESB. Wirelogs can be enabled from the log4J.conf file and you would find more information on how to do this from the following blog , however this method would require server restarting and access to the file system of the ESB server. Sometimes as a developer you would encounter a situation where you cannot restart or access the file system of the server to see wire logs. 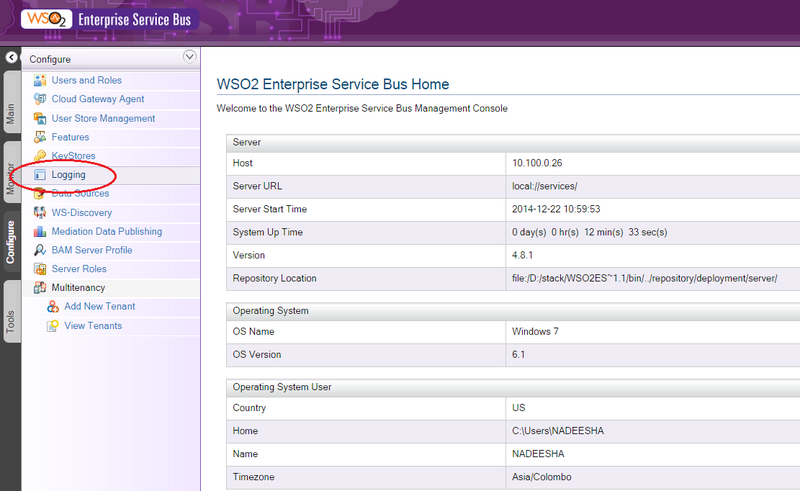 In that case you can enable wirelogs from the WSO2 ESB’s admin console UI. Wirelogs can be accessed from the admin console UI by following the steps given below. 1. Log into the admin console of the ESB. 2. Navigate to configuration tab and click on the logs icon as shown below. 3. Find “org.apache.axis2.transport” and change the log level to “Debug” as shown below. You have now enabled wirelogs on the ESB instance.